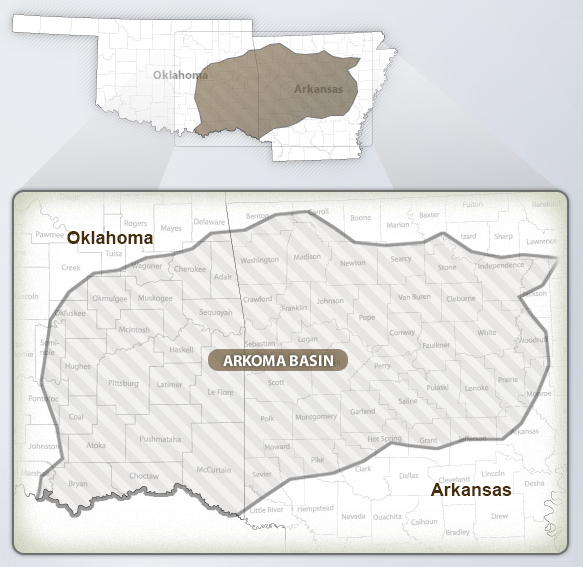 The Arkoma Basin Woodford Shale is an incredible play– it covers 1,500 square miles and has more than 40 rigs at work. Active operators include Newfield Exploration, Antero Resources, Continental Resources, Devon Energy, St. Mary Land & Exploration, PetroQuest Energy and XTO Energy. Simultaneous fractures are being tried in this play. Not only are wells fractured at the same time, the same segment of each lateral is fractured at the same time. The volumes of water, sand and people are sensational. The technique appears to make a material difference in production volumes, and well results are strongly improved over conventional fractures. Average per-well costs in the play have been $5 million and recoverable reserves 3 Bcf, but operators appear to be successfully pushing well costs downward and ultimate recoveries upward. The first wells to produce natural gas from the Fayetteville Shale were traditional vertical wells with low to moderate production rates. However, in the past several years vertical wells have been drilled down to just above the Fayetteville Shale, turned, and drilled horizontally through the rock unit. These horizontal wells intersect large numbers of vertical fractures which bring a flow of gas into the well and drain the surrounding rock. Fractures are also induced by pumping pressurized fluids down the well bore to fracture the rock unit. These additional fractures enhance the permeability of the Fayetteville Shale and allow more efficient gas production. The Woodford Shale, also within the Arkoma Basin, is located in SouthEastern Oklahoma. The Woodford Shale is known for holding a promising source of natural gas, trapped in the shale rock thousands of feet below the surface. The Woodford Shale find, is credited to the Barnett Shale find from more than 20 years ago. Over 1,500 wells have already been drilled and more are expected. US states in which we have Mineral & Leasehold interests.